The tools shown below have not been attributed to a maker. If you can identify any of them, please make contact. 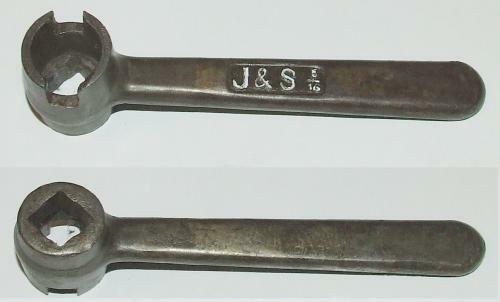 Small flat S shaped SOE marked "322 JWS 86"
Large flat Cast malleable spanner marked "7631"
Unusual Cast spanner markd "9140", approx 11 inches long. T Socket marked "040212" may also be "040272"
Identified: " Wrench, shaft plug in Repair Parts List for Allis-Chalmers Repair Parts List Model HD 7 track type tractor"
Large DOE deeply stamped "A. Gas. Co " the A is uncertain. Small, crudely made metric spanner marked "A.T. S.Y.T." 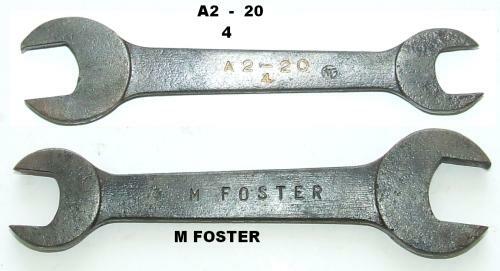 Hub spanner marked only "B.V" 14 inches long, hex end is 2-3/8 in AF. Small brass SOE marked "BARNES"
Blacksmith made S Shaped blacksmith made spanner marked B.T.C. in several places, approx 12 in long. Small SOE marked "C.D." Material looks to be one of the Non Sparking alloys. 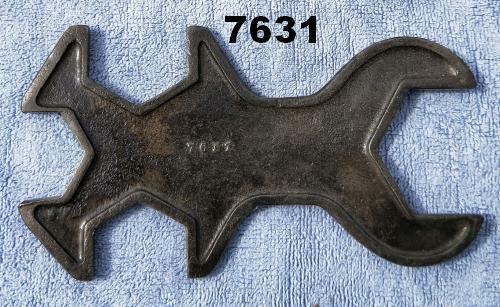 Large DOE marked "COOK & SONS"
11 inch multi opening malleabloe spanner, only marked "D" / dot, dash "
Cast iron socket , 4 inches long marked "E5288F" The numbers remind one of Caterpillar, but a listing has not been found. Cast Iron spanner with the words "FABRE VAISON" in raised letters in a depressed rectangle . Also markeds "PS" near one end. Large DOE Marked "F. H & Co" Back has metric and imperial sizes marked 42(mm) 1(inch WW) x 20(mm) 7/16(inch WW). There is also an imprint of a maker consisting of a 8 toothed cogwheel. Someone may know this mark. The disparity of jaw sizes is like the Ferguson tractor wrench. Marked G254, 10.5 inches long. Could this be a Cockshutt wrench? 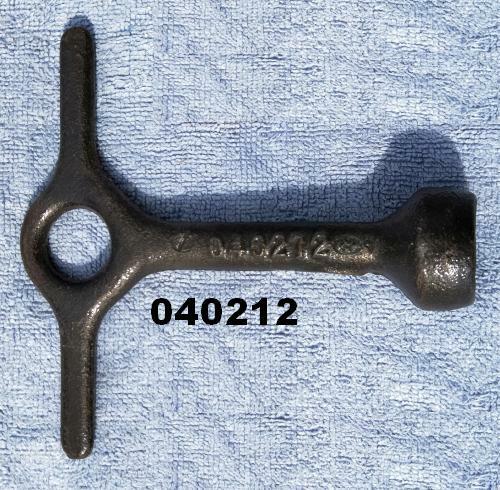 Small CI spanner marked "H224"
Heavy railway type spanner marked HO343, or possibly HG343"
Cast iron socket, 5 inches long. 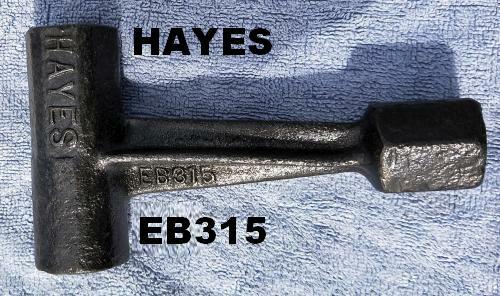 Marked "H532 symbol 2 "
T wrench marked "Hayes EB315"
Identified as "The tool is required when Hayes accessory wire wheels are fitted to model T Fords. I have these wheels on my 1925 Model T Roadster. One end of the cross tube fits the large locknut on the outer wheel bearing, which is threaded on the spindle. The other end of the tube is used to adjust the cone in the bearing, winding the cone in/out on the threads. The standard Model T tool will not fit inside the hub of the Hayes wheels. The smaller end of the T shaft on the Hayes tool fits the rear axle nut. These can be really tight, hence the twist in the shaft on the tool". Small machinery SOE marked "HENRY HAUSER S A BIENNE" Identified as a Swiss maker of precision milling machines for watch / jewellery making. Large DOE, thick heads marked "HM22"
Oddball spanner marked "J&S" This is Jones & Shipman as far as we know ---what is it for? perhaps a machinery control spanner? S Shaped podger deeply stamped "J&W Ltd"
Straight podger deeply stamped "J&W Ltd"
Straight SOE deeply stamped "J&W Ltd"
Blacksmith made SOE marked "H. B JACK"
Forged spanner . It has a maker mark - roundel with J E Co and the numbers forged in" 40-4-4"
Production DOE hot stamped "J. I. T & Co"
Vintage Whitworth spanner Marked "K2411"
Hook Spanner marked "LAWTON TOWMOTOR"
6inch DOE, looks like Motorbike related, marked "LS & Co"
Cast Malleable Iron DOE marked "M.28"
Multi ended spanner marked M1801. Large S spanner marked M.C.Q. on both sides. Blacksmith made buggy wrench marked "S. MERRIGAN"
Long Podger marked MG Co - could it be "McCalman Garde?" DOE marked MH Co... Massey Harris? Malleable Cast Iron spanner marked "M.M.F.Co"
Flat spanner marked "MTO Co"
Cart / axle spanner marked "J OSWALD Jnr"
Vintage Whitworth spanner impressed "W K & C Peace" over a pictorial dove and below that "Sheffield"
Axle spanner marked "RD & Co"
Multi spanner - looks motorbike related, marked "ROBERTS BOLTON"
DOE marked "ROEBUCK" Is this Seers Roebuck of something else? 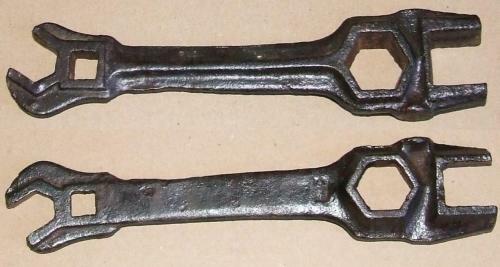 Multi ended spanner, almost a Deering Pattern, marked "S.589" It also has a symbol of 3 intersecting circles. This spanner is seen with the S and without. Refer above. 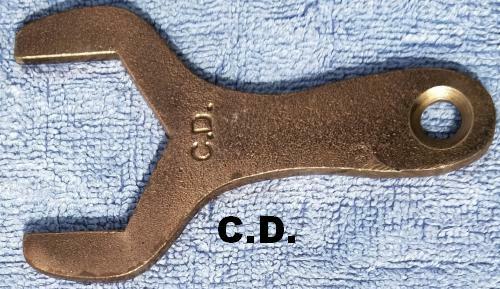 CI DOE marked "TITAN" with a symbol beneath - is this a tractor spanner? Malleable iron multispanner. Maker or implement unknown, spanner came from New Zealand. Has a serial number: "5120-12-145-3612"
Small Flat ROE marked "WITMY PATENT"